Once again, I couldn't resist going back to Hollywood & Highland's Sanrio (I keep thinking Vine street; thanks HK Junkie for the correction)... and look what I found. I bought the keychain with the intention to use it. I don't collect keychains like these, but it be cute to have something like this to kittyfy up my wardrobe even if it's a little thing. Thanks to my great Hello Kitty friend, I have now added H&M's hair ribbon accessory to my hair, which I get a lot of compliments. 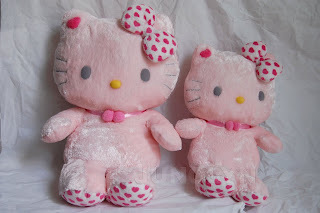 Here's a secret tibit that I might share with you Momoberry fans: Do you love the pink Momoberry plush? Well, I have one double copy (size M) that I might sell in the future. Wouldn't that be such a great treasure? How badly would you want it? 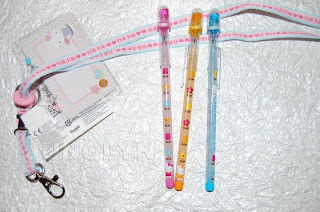 Though, I might not part with it unless I find the small version first to complete my pink set. 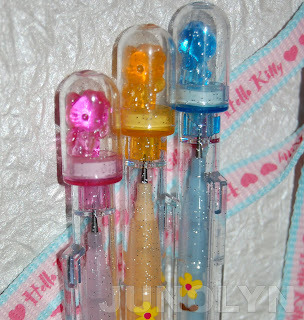 Wanna help a fellow sanrio addict out?